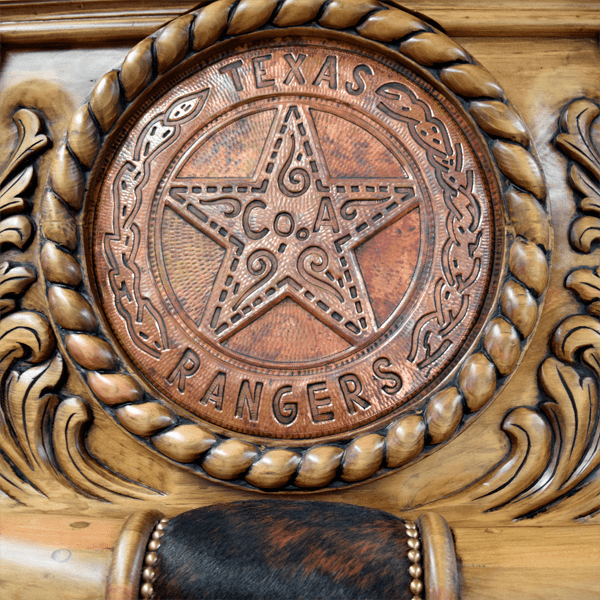 We have two options of beautiful, handcrafted end tables that can accompany this gorgeous, Western style headboard. Each end table mirrors the same details as the headboard, but end table ETBL108 is based on a vertical design and end table ETBL109 has a horizontal design. The bed´s headboard has a rectangular, solid wood frame, with a beautiful, top, crown molding. Centered in the crown molding is an ornate, hand carved, twist rope design. Below the crown molding is a large, circular, hand hammered, copper medallion, with a hand tooled, Texas Lone Star in its center. The copper medallion is encircled by a hand carved, twist rope design, and it is surrounded by gorgeous, hand carved, floral designs. Centered in the upper headboard are fabulous, hand carved horns, and the horns extends across the entire headboard. The center of the horns is accented with black leather, and the leather is secured by gilt nails. The front of the headboard has a large, padded panel with a curved top, and the panel is covered with two types of rich, brown, patterned, full grain leather. 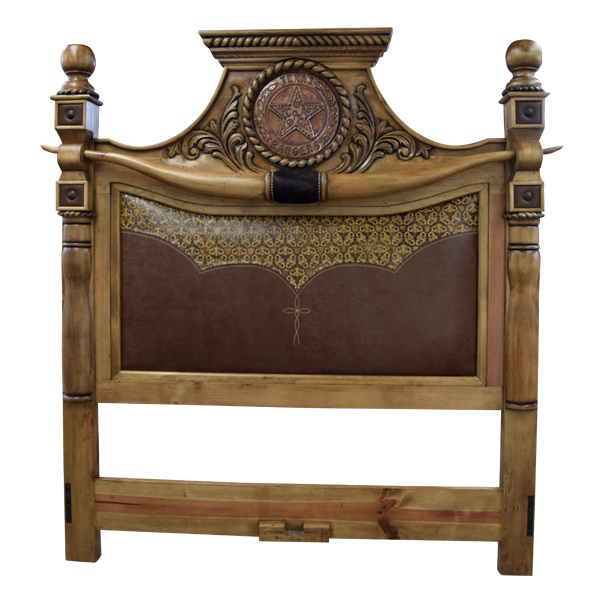 The upper, slightly lighter, patterned leather, is upholstered in a Western cut design, and a hand sewn, Spanish colonial style cross embellishes the lower leather. The upholstery is double stitched together for extra strength and durability. The headboard is framed by solid wood uprights, and the top of each upright is garnished with hand carved, floral designs, hand forged, copper conchos, and with a hand turned sphere. The headboard rest on square cut legs. It has a light finish, and it is made with the best, sustainable, solid wood available. The headboard is 100% customizable.